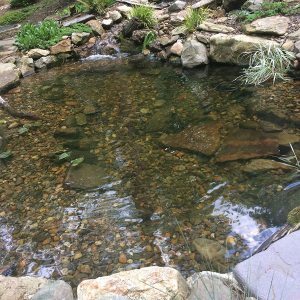 Peachtree City Deluxe Spring Pond Cleanout - Water, Color, & Stone, Inc. 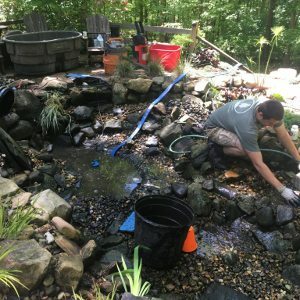 This past week we went to one of our masterpiece creations located in Peachtree City to perform an annual Spring cleanout to get our clients pond ready for this year’s active season. About 4 years ago we were asked to create an outdoor sanctuary on a barren rocky slope situated in a hardwood forest. “Can you build us a water garden with two patio areas and fix a bad drainage problem coming from our steep driveway?” Utilizing large, furniture sized boulders, a retaining wall allowed for an elevated terrace to be back filled with 60 yards of soil. The project included a 12’x16’ pond equipped with a 10,000gph pump that feeds two streams and a bog area, two patio spaces connected by flagstone walkways, a fireplace, and dry creek bed that serves as the drainage solution. Needless to say, this is one of our proudest projects as it turned out wonderfully and after four years the flora has matured delightfully. The spring cleanout maintenance was truly needed for this water feature. The setting, while beautiful, presents maintenance challenges as it sits under a number of huge oak trees that rain debris all year round. While we were there, as we do all of our cleanouts, we started by draining the pond with our cleanout pump and we use the discharge water to clean the filter pads and to fill a tub for temporary housing for the fish. After that we power wash the boulders in the pond to remove the algae and then use a hose to flush out the dirt and debris starting at the top of the stream and work our way to the bottom of the pond until it’s all removed. We also cleanout the skimmer and inspect the pump. 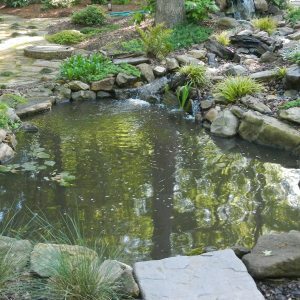 After the pond is cleaned we don’t stop there, we also inspect and replace the underwater lights, prune and thin out over grown plants, add any plants requested, hide any exposed pond liner, and tend to any other needs of your water feature as every pond is different and calls for different measures. After that is done and the pond is filling, we add the necessary water treatments before putting the fish back. These cleanouts and maintenance visits are crucial to the longevity of your pond and accompanying components. A pond that is neglected for too long will cause undue stress on the pump, skimmer, plumbing, water quality and ultimately the ecosystem it is trying to carry. Our services give the attention needed which will make your pump and system last longer and support a thriving ecosystem. We are booking annual cleanouts now and are also offering monthly and quarterly maintenance plans so give us a call or fill out the simple form provided on the website for us to come out and get your water feature in tip top condition.